In addition to writing this blog, I founded, produce and own my very own whisky: Brenne (keep in the loop by liking us on Instagram HERE & Facebook HERE), a limited-edition Single Malt made seed-to-spirit in Cognac, France (despite being a New Yorker). I couldn’t be more excited because I’ve introduced not just a new player in the World Whisky category but also a new taste profile in the Single Malt category. In brief, Brenne is a Single Malt from France that is finished in Cognac casks. My first release, the Estate Cask, is extremely smooth, approachable and a very fruit-forward. I always say, “You can’t lead by following” so why create something that’s already been done? I think New York is the best city in the world – but I have always been inspired by France. I’m thrilled that after years of hard work (including running my own spirits import/export company, Local Infusions), I believe we have captured the essence of the South of France in this stunning single malt. Now that that’s out of the way … it is important to me that you know I am not writing this blog to specifically promote my business or any particular products. Rather, I feel so fortunate to work in one of the best industries, filled with amazing people that I needed to create a place where I can share my experiences with you as they relate to one of my very favorite spirits: WHISKEY! I hope you enjoy my non-traditional approach to whisky-blogging. There are plenty of awesome bloggers out there writing really thorough product reviews and where I will do a product review on (the very rare) occasion, I’m more excited to share with you all of the many facets of the wonderful world of whisky. You’ll find most posts are currently about my journey as an entrepreneur in the whisky world but occasionally I’ll also write about other distilleries, distillers, stories, stores, recipes, tastings, bar-ware, books, events, whisky travel … really anything that I’m into & think we should be talking about. I promise, if I ever write a post in hopes of it benefiting my company, I will certainly make it known! Thanks for following, for joining in on the conversations, for always teaching me something new, and for all of your amazing support. Featured on: CBS, ESPN (TKS & PTI shows), WSJ’s MarketWatch, Food & Wine Magazine, Crain’s New York Business Review, Chicago Tribune, Cigar & Spirits, judged ’13 WWA (World Whisky Awards), SeirousEats, Heritage Radio, Unfiltered Magazine, Uncrate, Redbook Magazine, WhiskyCast, Whisky Advocate, Whisky Magazine, Liquor.com & more. She also won Whisky Magazine’s Whiskey Brand Innovator of the Year 2014, Highly Commended and an American Graphic Design Award for Brenne Whisky. Thanks for the positive words and for taking the time to come by and say “hi” – blogging takes a lot of time & patience so I love supporting other bloggers who are out there spreading the good word of the dram! I’m now following your blog too. Thanks again and I’m looking forward to chatting about our favorite subject! Thanks so much for your comment here! (Sorry for the lateness in my response … I didn’t see that you had posted a comment here!). I think you have a great blog! Love the information you provide on your site. Are you in the VA/DC/MD area? Thanks Allison. I am in Tampa. Are you on FB or Twitter? I sotimes make it to DC so we’ll have to have some wine and whisky when I do! Let’s definitely connect if/when you swing through NYC next! Will do. I am WCWD on twitter as well. I was born in the Bronx. If you check out my new book, let me know if/how you like it. A chapter on wine and alcohol; health benefits and as part of healthful eating strategy. Feel free to use in your promotions! So happy to find your delightful blog! We are great single malt fans here at LairdWilliam.com – I’ll visit often! Lovely to e-meet you! Thank you for coming by and leaving me a nice note! Happy to know 2 more single malt fans 🙂 I am liking your site too! I think I’ll have to become a “Lady” later … just need to decide which crest! Great fun! French single malt whiskey? Well, okay. I’m a MacAllan and Glen Livet man myself. Have been to France many times, open to suggestions. Please add me to your media list, thanks. We periodically review fine liquor. Thanks for the comment! You should give Brenne a try! 😀 Hopefully it’ll open your mind as to some other possibilities of flavor exploration within the Single Malt category! Allison, listen for your shout out at the end of PTI today! Send more product! I am a friend of Sarah’s and tried your wonderful whiskey last weekend, LOVED it! Can I find it anywhere in NJ? I would love to promote it on my blog, Stacey Snacks. Thank you so much for your Brenne-thusiasm (couldn’t resist!) and support! I’m a big fan of your blog & very honored to have Brenne mentioned. It’s not available in NJ yet but it’s definitely available in NYC as well as online retailers who can ship to most states! Check out the list here: http://drinkbrenne.com/buy & thank you again! I’ve read much about your new business venture and wish you all the best with Brenne Whisky. I have had no success locating a local retailer of your product, and wonder if you might point me in the right direction for retailers in the Sacramento area (where I live) or San Francisco (where I frequently travel for work and fun). I’m quite partial to cask strength single malts that are aged in sherry or port casks, and while I’ve never tried a cognac-casked whisky, I’m quite intrigued to try one. Thanks again for any leads you might provide. Thanks so much for such a lovely comment. As of February 2013, Brenne is only available in brick & mortar shops in New York state, however, there are a growing number of e-commerce sites that offer Brenne online and can ship to most states (I know they can ship to CA with no problems). Please check out the list HERE and click away! Thank you so much! Thank you for the visit, and the follow! Look forward to more of your posts and reviews. They mix you with coke! even lemonade! 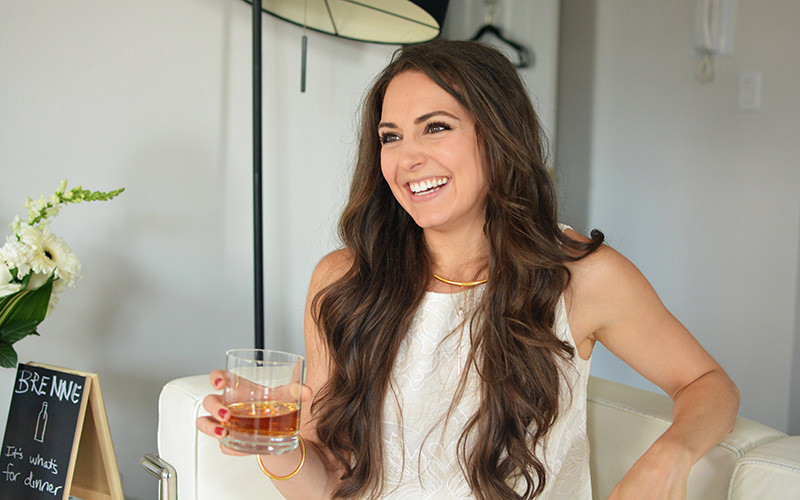 Hi Allison – Great blog, always good to find a fellow whiskey chica blogger. So interested in your non-traditional whiskey reviews – can’t wait to try and find some of these in my neck of the woods. Do you export to France…? It’s not all drinks, but I’d love it if you stopped by to visit me at champagnewhisky.com – hope to be able to attend one of your events in NYC next time I’m there. Thanks for your comment! Whisky & champagne, 2 of my favorite beverages! I’m sure I’ll enjoy reading your blog. Brenne isn’t available in France yet but do keep following our facebook page for regular updates! I wondered if I could trouble you for some advice. My family and I are of Scottish decent and are great whisky drinkers and appreciators! We have always had a yearning to label a single 10/12 year old Scottish malt whisky to wholesale to retailers in this country, and to export. Do you, as a company (or do you know another) who would sell us a relatively large quantity of whisky (say 10,000 litres). You mention having your own brand, how does one go about that? I would very much appreciate any information you can give me, to move our dream forward. Not sure what country you live in which may or may not make your goal hard or harder – but that’s not to say it’s not impossible. Unfortunately, I don’t have any Scotch producer contacts that I could share with you – I’m not an independent bottler (IB) but I would suggest teaching yourself first by learning what’s out there – who is doing what – and figuring out how you could offer the world something different – and then seeing if any of the IB’s would take a call with you. But I would ultimately suggest learning as much as you can from the web & books before speaking with anyone – you’ll want to maximize your time with them by asking questions you know you CAN’T find with a simple google search. There are many, many facets to this business – no matter how small or large your brand may become you’ll still have to deal with and work within all of the various angles. Hope that’s at least somewhat helpful. It’s certainly not easy – I would never lie to someone and have you believe that it’s something that can be done halfway – it’s not. The alcohol industry is big business – and all of the many rules and regulations, no matter which country you’re in, create many road blocks – but if you remained focused on your vision, are smart about how you move forward, are not afraid of hearing “no” have the passion, drive and the funds to back it all up … then by all means jump aboard and godspeed! Do you ever find yourself in the UK – specifically London? Here at The Athenaeum Hotel – http://www.athenaeumhotel.com/food/whisky-bar- we are developing a marketing campaign to bring more women to the world of whisky, and I would love to connect with you. I just recently started appreciating Whisky so hopefully I’ll learn a few things. Thanks!! It’s a pleasure to e-meet you! I just looked at your blog – which is fantastic & I’ll now be happily following along – but you certainly caught my attention with the surfing! That is something I have always wanted to do … The closest I got was an hour-long wrestling match with a full-body wet suit, in the hot August sun where there was plenty of sand finding its way between my suit and my skin. It felt more like an exhausting exfoliation-treatment-meets-personal-sweat-lodge then it did like any sort of activity PREP I’ve ever done. (seriously, I’m not a big person but you should have seen my friends stuffing me into this thing like they were punching down rising dough or filling a really large sausage! I was paralyzed with laughter … which didn’t help at all). After they finally zipped up my suit, I was SPENT and had run out of time! LOL. Haha, one day I’ll make it back out there. In the mean time, there is your blog! Keep writing & surfing safely. Is Brenne available in upstate NY specifically WNY (Buffalo-Rochester-Syracuse)? I enjoyed reading your story and am curious about the use of Cognac barrels to age whisky. Found you through the Coopered Tot. I love what you’re doing. One day I hope to taste your elixir. I had Brenne for the first time this past Shabbos. It was amazing. I have some questions I would like answered that involves understanding the kosher aspects of this whiskey. To whom shall I write? Glad you enjoyed it! Regarding your whisky + kosher questions, I am no authority on the matter, however, you’re welcome to contact me via http://drinkbrenne.com/contact-us. If you’re questions are Brenne-specific, I’ll do my best to help. If they’re more generic then perhaps you’d also like to reach out to the guys over at the Jewish Whisky Company (http://singlecasknation.com/). I love your blog as well as Brenne whisky! I would love to set up a whisky tasting at our flagship location with your brand! Is there a contact I can reach out to regarding setting something up? In any case, your story is very inspiring! Thank you so much for the kind words & for following along! I’m way overdue for a post but hopefully will get another up this weekend. 🙂 Just sent you an email – I’d love to do an event together! Hi Allison, we’re writing a guide to choosing scotch on Qosy at the moment and would love to feature you as one of our experts. If interest could you drop me an email (marcus at qosy.co) and I can send more info over? Just double checking if you sell your whiskey and moonshine at Amathus in London? Love the packaging! LOL I missed out on buying a bottle and now I want to buy one even more. I’m in San Francisco. This blog is strictly a labor of love. Please respect the content and photos as property of the author. I do not receive payments for any of the products I write about. All view points shared are my own (unless otherwise noted). I do not receive any money from advertisers. All ad's that you may see are placed there by wordpress, the hosting site for this blog, and have no direct association with The Whisky Woman. whiskywomanblog at gmail dot com though you'll probably get a faster response by sending me a tweet to @ WhiskyGirls instead!